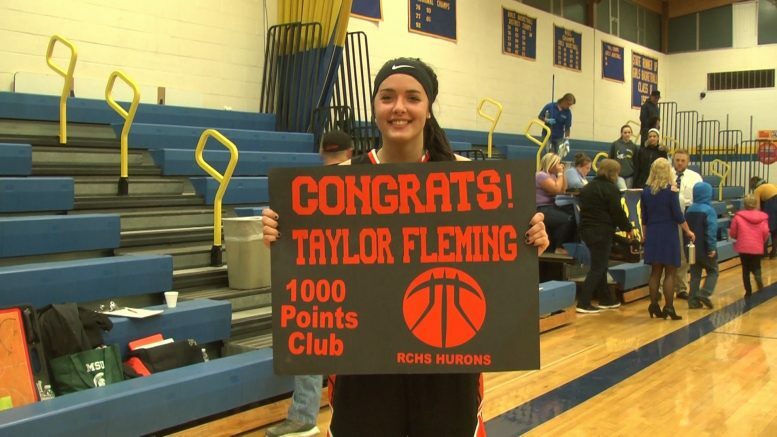 ROGERS CITY, MI — After scoring 17 points against Hale, Rogers City senior Taylor Fleming was 19 points away from scoring 1,000 points, a goal she’s been trying to reach for a while. The special moment happened when the Hurons traveled to Mio to face the Thunderbolts. Fleming got off to a hot start scoring buckets on steals from the full court press helping her score 10 points in the first half. The moment came down to the fourth quarter. Two points away, Fleming grabbed the rebound, took the ball coast to coast, but dished it down low to Karissa Rabeau for the bucket. She still needs two with less than a minute to go. Then Fleming was sent to the charity strike. Free throw number one was good. Then nothing but net for the second free throw, and the Hurons surround Fleming with tears of joy as she reached her 1,000th point. Fleming made exactly 19 points against Mio to help the Hurons win 61-46. She also contributed 14 rebounds and one steal.